Posted April 24, 2015, 4 a.m. The victims vary in age. They were killed in upscale Stevenson Ranch and on the most dangerous streets of South L.A. The specifics may differ, but the homicides of women in Los Angeles County this year take on a deadly rhythm. On Jan. 14, Mary Matsumoto, 72, was found shot to death in her San Pedro bedroom. Her husband has been charged with murder. On Feb. 1, Yi-Tung Weng, 48, was tortured and stabbed to death in a downtown apartment. Her son has been charged with capital murder. On March 5, Tanaya Shanette Goins, 32, was shot to death in her San Gabriel apartment. Her brother has been charged with murder. 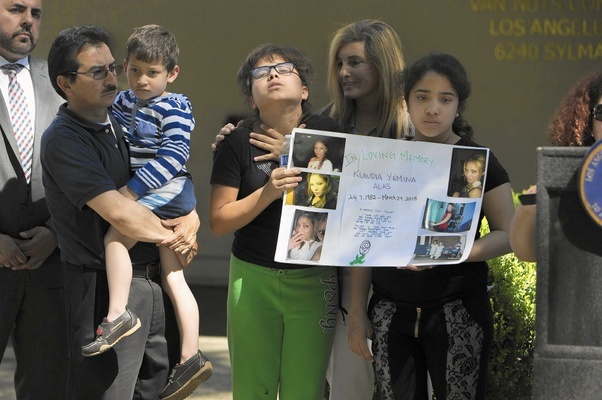 On March 24, Klaudia Alas, 32, was found stabbed to death in a black Dodge truck in Van Nuys. Her boyfriend has been charged with murder. A day later, Lakeisha Lynall, 32, was found shot to death in an alley in Westmont. Victor Terrazas, her boyfriend of about four years, was killed by deputies nearby. He was the only suspect in the slaying. On April 12, Lucille Wills, 74, was found stabbed to death in a Carson bedroom. Her husband of more than 50 years was dead in the living room from a self-inflicted gunshot wound. This year, 19 women have been killed in L.A. County, according to coroner's records. In the majority of cases where the suspect has been identified, the victim knew the assailant. "When I was young, I was so afraid some strange man would come after me with a knife," said Katherine van Wormer, a professor of social work who wrote the book "Death by Domestic Violence." "When really, the people you need to be afraid of are the people in your family — especially when you break up." About 93% of female homicide victims who are killed by men know their killers, according to a report released last year by the Violence Policy Center, a nonprofit that advocates for gun control. That number hasn't changed much over the last decade, said Josh Sugarmann, the center's founder. Sheriff's Lt. Dave Coleman said that in 10 years of working on homicide cases, those involving women routinely involve domestic violence or family members. "Most of the time, we have an idea or a theory right away," he said. Los Angeles Police Department Det. Greg Halka, who investigated the Matsumoto slaying, agrees. He estimated that in the Harbor Division where he works, half of the female victims knew their assailant. "Any time a woman dies who is married or in a relationship, who is the first person you want to talk with?" he said. But some cases are more difficult to solve. On Feb. 28, Najat Pennell, 41, was found stabbed to death on a bus bench in the 4000 block of Wilshire Boulevard. Her daughter, Lia Davis, said that Pennell had been living on the streets since 2007. When she was killed, she had an iPod, a video recorder and some cash. "I don't get why someone would stab her and not take the money she had on her," Davis said. LAPD Det. John Skaggs has gone to the area at least 40 times since the slaying. Skaggs said Pennell was probably killed about 3 a.m., so he's been back as early as 2:30 a.m. to try to find witnesses. "Nobody is out," he said. "Nobody is hearing anything, nobody is seeing anything. That makes it tough." Davis said she dressed her mother for her funeral and applied makeup to her face, which was frozen in what Davis calls a "hurt" expression. She wonders whether her mother was caught by surprise. "I'm absolutely lost," she said. "Why would someone want to hurt her?" I grew up in a family with domestic violence. Women are taught from an early age to accept it, to forgive it. Men see it growing up and use it as their father's did to control the household. It spans all races and economic backgrounds. I think the best approach is an early approach like promoting awareness of domestic violence in schools, starting from elementary. If young boys and girls are taught from an early age that it is wrong, that is where you get a change. I don't see that happening unfortunately. People who don't have to live in it will not see as their problem and will not want this in their schools. Until of course their son or daughter get involved with someone who is abusive in high school or later in life. Eventually it touches most families. Most women know someone who is a victim or whom they suspect is one. — Rosan Duran May 28, 2015 at 9:59 a.m.
— Violence with Intimate Partners ; the men who call these assailants "cowards" often are known by another name. "Jurors". — syscom3 April 25, 2015 at 10:29 p.m. While I certainly agree that most Female victims know their killers, I think that they simply ignore all the warnings signs before that tragic end. Most of those Homicides listed were of the 1st degree. Planned and plotted likely for days in advance. But on the flipside, their are also females who have witnessed their Man victimize others and still remain with the guy. But only when faced with charges of being an accessory after fact, will they finally come forward to say what her man may have or may not have done. A generous commentor here who goes by the name Meck I believe, has posted numerous case files and legal briefs about defendants appealing their Murder charge(s). But when you read them, their is always a female intertwined in the case. The perp is usually driving her car or stashing evidence used in a crime at her home. She looks the other way and claims to have not known anything until pressed. So clearly something is wrong and as a result, either she or someone else becomes a victim. — Chevalier Alcott April 24, 2015 at 1:40 p.m. These are not murders of opportunity, not killings by strangers. These murders are perpetrated by the very partners and family members who should be protecting women. Domestic violence against women is rampant in the U.S., and even moreso throughout the world. Only when GOOD and decent men stand up and say irrefutably that COWARDS beat and kill women, and that it must stop, will these murders and killings stop. It is the MEN who must teach boys and other men that violence against women is the last refuge of weak, fearful, and spineless men. — Violence with Intimate Partners April 24, 2015 at 1:13 p.m. Most crimes of violence are committed by people who know the victim. This is also true of child kidnapping and molestation. People are so afraid of strangers that they don't realize the greatest threats come from those that they see everyday. — rtamtc April 24, 2015 at 9:08 a.m.